1. The Total Money Makeover by Dave Ramsey – If you didn't know that I absolutely love this book, then you don't read Money Q&A very much. Maybe you are new. That's okay. It is an incredible book. It is where everyone should start. In The Total Money Makeover , Dave Ramsey provides readers with his system for seven baby steps to financial freedom that includes paying off your debt, investing 15% of your income for retirement, saving for your children's education, paying off your mortgage, and living like no other financial peace. 2. The Automatic Millionaire by David Bach – I love David Bach's book, The Automatic Millionaire! This book is one of the first personal finance books that I ever read. Now almost two decades later, David Bach's Latte Factor is now a common phrase in our frugality vernacular. The Automatic Millionaireis a bestselling classic that has spanned a whole genre of personal finance books that feed off his system such as Smart Couples Finish Rich, The Automatic Millionaire Homeowner, Start Late Finish Rich, and many others. 3. The Intelligent Investor by Benjamin Graham– Benjamin Graham is considered one of the greatest investment advisors of the twentieth century. Graham pioneered the philosophy of value investing which shields investors from substantial error and teaches them to develop long-term strategies and has made The Intelligent Investorthe stock market bible ever since its original publication in 1949. Over the years, market developments have proven the wisdom of Graham's strategies and made his book one the best personal finance books on the market. 4. The Millionaire Next Door by Thomas Stanley and William Danko – Millionaires have many of the same traits as each other. The bestselling book, The Millionaire Next Door, identifies seven key common traits that show up again and again among those who have accumulated wealth. Most of the truly wealthy in this country don't live in Beverly Hills or on Park Avenue. They live next door, right under your nose without you ever realizing it for the most part. What makes these neighbors so successful? Thomas Stanley and William Danko reveal those key traits in their best selling book. 5. The Other 8 Hours by Robert Pagliarini – You day does not start when you get out of bed. It actually begins when you get home from work. For a typical person, he or she spends approximately eight hours per day sleeping. Another eight hours of our day are lost to our job. But, there are eight hours of our life that we control, and it is those eight hours that define us, define our financial freedom, and in many cases define our happiness in life. I absolutely love The Other 8 Hours! It really opened my eyes to the way that I was spending the time when I wasn't working or sleeping. 6. The Wealthy Barber by David Chilton– David Chilton simplifies the complex puzzles of personal finance and helps you achieve financial independence. With the help of his fictional barber, Roy, and a large dose of humor, Chilton shows you how to take control of your financial future slowly, steadily, and with success. Chilton's plan in The Wealthy Barberthat is detailed in an entertaining story is no get-rich-quick scheme, but it does make financial independence possible on nothing more than an average salary. 7. Your Money Or Your Life by Joe Dominguez and Vicki Robin – In an age of great economic uncertainty when everyone is concerned about money and how they spend what they have, this new edition of the bestselling Your Money or Your Life is an essential read. With updated resources, an easy-to-use index, and anecdotes and examples particularly relevant today-it tells you how to get out of debt and develop savings, reorder material priorities and live well for less, resolve inner conflicts between values and lifestyle, save the planet while saving money, and much more. In Your Money or Your Life, Vicki Robin shows readers how to gain control of their money and finally begin to make a life, rather than just make a living. Your Money Or Your Lifeoffers a nine-step program for living more meaningful lives, showing readers how to get out of debt, save money, reorder priorities, and convert problems into opportunities. 8. Crush It by Gary Vaynerchuk – Do you have a hobby you wish you could do all day? An obsession that keeps you up at night? Now is the perfect time to take those passions and make a living doing what you love. 9. The Richest Man In Babylon by George S. Clason – Read by millions, this timeless book holds the key to success-in the secrets of the ancients. Based on the famous "Babylonian principles", it has been hailed as the greatest of all inspirational works on the subject of thrift and financial planning. This celebrated bestseller, The Richest Man In Babylon, offers an understanding of and a solution to personal money problems, revealing the secrets to acquiring money, keeping money, and making money earn more money. 10. Beating The Street by Peter Lynch – Peter Lynch's "invest in what you know" strategy has made him a household name with investors both big and small. An important key to investing, Lynch says, is to remember that stocks are not lottery tickets. There is a company behind every stock and a reason companies and their stocks perform the way they do. In Beating The Street, Peter Lynch shows you how you can become an expert in a company and how you can build a profitable investment portfolio based on your own experience and insights and on straightforward do-it-yourself research. Did I miss one of your favorite personal finance books? I'd love to hear what you keep on your nightstand and refer back to often. I'd love to hear your thoughts in the comment section. 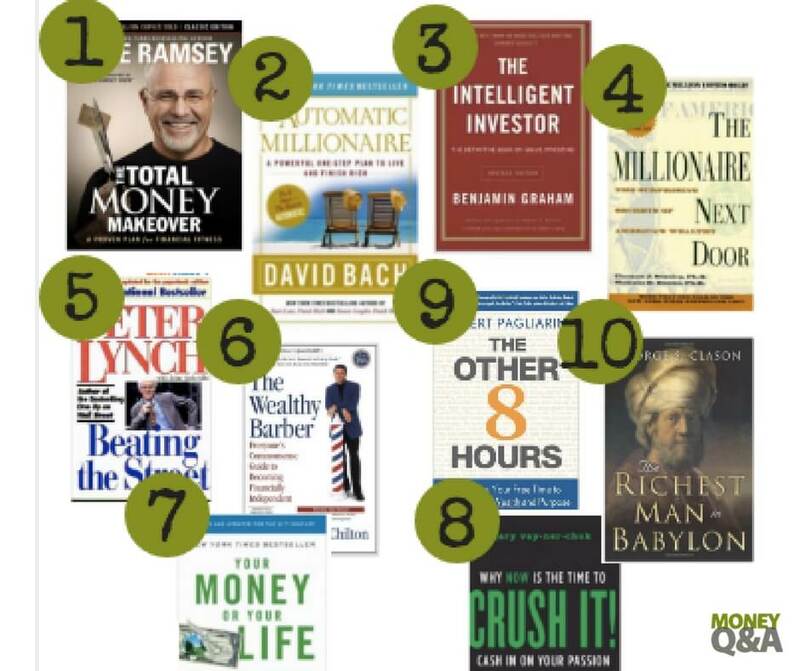 The post Top 10 Personal Finance Books That You Must Have On Your Bookshelf appeared first on Money Q&A. By creating the modern discipline of economics, Adam Smith redefined business (or commerce as it was more commonly called at the time) and the subsequent accumulation of wealth as subject to natural laws rather than a reflection of divine will. By reframing economic activity as essentially amoral, Smith thus broke with over 1,700 years of Christian tradition. Fun factoid: Contrary to popular belief, Adam Smith was not a proponent of free trade. Instead, he saw government regulation as a check upon the ability of businesses to form cartels and monopolies. While Smith postulated that economic activity was theoretically subject to reason, Charles MacKay proved that in practice it's just as frequently driven by emotion and illogic. Mackay's description of the crash in stock in the South Seas company coined the term "bubble" and his description of Tulip Mania remains the archetypal example of unsustainable economic growth. Fun Factoid: one of the fads MacKay describes in his book is the term "flare up" a buzzword still used today to describe an unexpected but possibly dangerous event. In addition to being a fascinating memoir, this was an expose of the business of slavery, an industry that at the time comprised about half of the US economy. Just as people today pretend that sweatshops in Walmart's supply chain consist of happy workers glad to have a job, people back then pretended that slaves were well-treated and happy to be enslaved. Solomon Northup's bestseller put the lie to the myth. While not typically seen as a business book, after its publication Darwin's theory of natural selection and evolution migrated immediately from biology into economic theory. The concept of Social Darwinism was quickly applied to business and management theory in order to justify the horrors of child labor and (later) to provide a legal framework for anti-monopoly legislation. Fun Factoid: Aware that his ideas were a direct assault on religious fundamentalism, Darwin shied away from including human beings in his theory of evolution. Dale Carnegie's perennial bestseller created both a code of behavior for businesspeople and provided step-by-step recipes for forging strong business relationships. The book also launched the self-help publishing industry, which today consists of well over a million books, not to mention hundreds of millions articles, tapes, videos, podcasts and courses. Fun Factoid: The original edition of HtWFaIP contained advice for wives that included "don't nag" and "read a good book on the sexual side of marriage." Where Carnegie's approach to self-help focused on how to behave outwardly towards others, Norman Vincent Peale's book presented an alternative approach--that your success in business depends upon the quality of your internal thought processes. It's fair to say every self-help book ever published is essentially a rewrite of either Carnegie, Peale or both. Fun Factoid: Norman Vincent Peale lived to be 95, a fact that he attributed to positive thinking. In this groundbreaking book, Marshall McLuhan redefined media not as a carrier of information but as its own agent of change. His thinking about the relationships between content and its delivery quickly permeated the worlds of marketing and business, influencing and leading to the creation of the Mad Men-style of advertising agencies. Today no article is written about the impact of the Internet that does not draw heavily upon MuLuhan. Prior to Future Shock, Americans saw technology as ushering in an era of pleasurable leisure. Alvin Toffler pointed out that the rapid advance of technology was actually creating stress, disorientation and "information overload" (a term that he coined.) Toffler's book has influenced three generations of critics of the business world's over-reliance on technology. Fun Factoid: Future Shock launched a new job category "Futurist" that for a couple of decades held a certain cache among management consultant types. Today, futurists are few and far between. Prior to Bosworth's classic, every sales book and sales course treated selling as a form of persuasion and manipulation. Back then, selling was considered something that a salesperson did TO a customer. Solution Selling redefined selling as something that a salesperson did FOR a customer. The book redefined selling as a process of asking the customer questions and satisfying customer needs based on those answers. Every sales book published since then is a riff on this basic idea. Fun factoid (and Full Disclosure): When I did some ghostwriting for Mike Bosworth a few years back, he admitted that "solution selling doesn't really work all that well." This was not because the ideas weren't valid but because few salespeople had the skill to correctly implement them. Prior to the publication of this book, corporations were expected to show loyalty to their employees. Layoffs were an admission of management failure and many firms, notably IBM, promised lifetime employment. This book explained that, no, firing people and eliminating jobs is a wise and noble act, and that CEOs who decimate their companies deserve great rewards for their "bravery." Sad to say, the business world has glommed onto this load of self-serving codswallop, to nobody's benefit (except the .1%, of course). Fun factoid: The majority of the firms this book held up as exemplars were bankrupt or out of business within 20 years of its publication.